MDerma™ Medical skin needling is a minimally invasive skin rejuvenation treatment designed to improve the appearance of fine lines and wrinkles as well as superficial scars. The treatment uses state-of-the-art electronic skin needling device with tiny needles oscillating back & forth at high speed to create tiny puncture wounds on the skin. This process stimulates the natural collagen production by generating a wound healing response in the treated skin and is far superior to any skin needling roller device or older style skin needling pens. Skin needling works best when combined with other skin rejuvenation procedures. What are the benefits of Medical Skin Needling? Scars following injuries or surgery. How is the procedure performed and does it hurt? 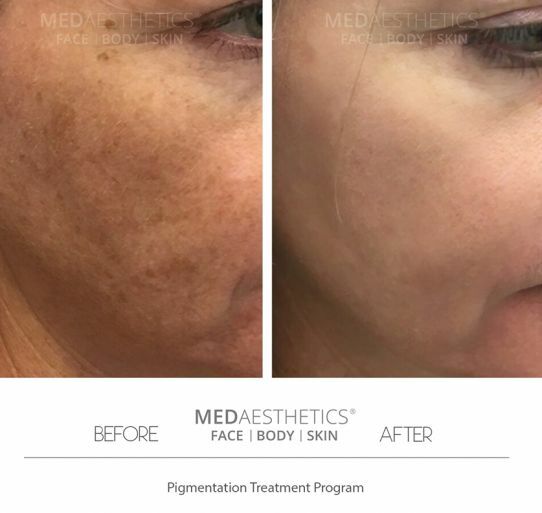 At Medaesthetics, the procedure is performed using a specialized skin needling device called M-Derm™. A topical anesthetic is usually applied before treatment to minimise any discomfort. Your treatment can take anywhere between 10 minutes to half an hour, depending on the area you are having treated. Medical skin needling is generally safe to use on all skin types and all skin colours. There are very few adverse reactions associated with this procedure. Which includes prolonged redness and delayed healing in very few cases. For collagen induction therapy we recommend to start with three treatments with a minimum separation time of four to eight weeks between each treatment session. For scar reduction therapy an average of three to five treatments is recommended. We often combine skin needling with PRP to deliver superior clinical results. What are the side effects of a skin needling procedure? There are virtually no serious side effects. Some patients prone to acne have reported mild and transient breakout episodes post this procedure. Post Inflammatory Hyper-pigmentation (PIH) is an extremely rare and temporary complication. Is there any risk of post procedure infection? Provided the procedure is done under strict aseptic conditions in a medical clinic, post-operative infections are very unlikely. It is important for anyone undergoing a skin needling treatment at a beauty salon (or any non-medical environment) to understand that the penetration of needles into the the skin should not be deep enough to cause any bleeding or oozing of blood. What is the downtime after a skin needling treatment? The inflammatory reaction of the skin is extremely short and fades significantly within hours from redness to a pinkish hue that may last for 12 to 24 hours on average. In order to reduce visible redness, we recommend healing minerals, peptides or hyaluronic acid after the procedure, and to protect the skin with medical strength sun blocks. We also recommend the use of medical grade makeup to help with the healing. Direct sun exposure should also be avoided. What should I use on my skin after the treatment? It is extremely important to provide all essential nutrients to the skin post a skin needling procedure. This involves a gentle cleanser, topical antioxidants like Vitamin B and C serums, hyaluronic acid based moisturisers and micronised zinc/titanium sun blocks. We have a range of medical grade skin care products that we recommend our patients use after their treatment. We find that medical makeup like Oxygenetics® is excellent in hiding the redness and promoting healing. What are the differences between medical strength and beauty therapy grade skin needling procedures? Who can perform them? Only trained medical practitioners should carry out medical grade skin needling. Often, it is confusing for clients to distinguish the difference between medical strength and non-medical skin needling. The difference is in needle size. Medical devices have longer needles to reach deeper skin layers. The needles of the non-medical devices are very short, not more than 0.2– 0.5 mm. Therefore they are good for superficial skin rejuvenation only. What is a home care derma-roller? The home care derma-roller is not a replacement for medical grade skin needling in clinic treatments, but it helps to maintain beautiful skin when used regularly at home. It maximises skincare product penetration through the skin barrier (stratum corneum) and improves skin’s tone and texture by stimulating epidermal cell proliferation. What are the effects on the skin with the medical derma-roller? Improves the appearance of stretch marks. This is assessed during the consultation with the treating doctor in our Perth clinic. A treatment is mapped out for each client and the cost can be assessed at this time. This is based on a clients’ unique requirements and the result that is desired. Skin needling may be combined with other treatments as a package and the overall cost will be discussed at consultation.